Kevin VanDam's extreme bass fishing versatility and consistency has him in the hunt for his 8th Angler of the Year title if he gets a little help on Lake St. Clair this week. Three of Michigan's four Elite pros, Jonathon VanDam, Chad Pipkens and Kevin VanDam, drew upon their Great Lakes expertise to post their best results of the Elite season, finishing 2nd, 10th and 14th respectively in the Evan Williams Bourbon Showdown, August 8 - 11 on the St. Lawrence River. 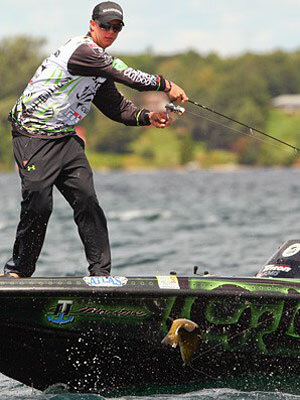 Michigan's Elite pros are hoping their St. Lawrence River success carries over into next week's Plano Championship Chase on Lake St. Clair (August 22-25, 2013, Lake St. Clair Metropark) where they will be joined by fellow Michigan Elite Series pro, Nate Wellman. This is Michigan's first Elite Series event and more importantly, it's the last chance to accumulate points toward the coveted Bassmaster Angler of the Year (AOY) title. 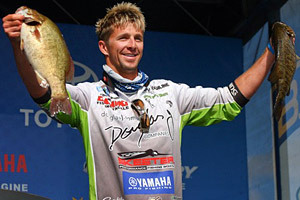 But only one of the four Michigan pros, KVD, is still in contention. Currently in third place, KVD trails AOY points leader Edwin Evers by 39 points. If he's going to add an eighth AOY title to his impressive list of accomplishments, KVD will need some help from Evers and Aaron Martens – currently in second place. To put his challenge into perspective, Evers needs only to finish 25th or higher to shut out KVD. The Angler of the Year title rewards consistency – something KVD has always excelled in and the reason he has seven AOY titles already and has qualified for 23 straight Bassmaster Classics. His uncanny ability to adapt to any type of water under any conditions has put him in position to win another, leaving him one shy of Roland Martin's all-time record of nine. When KVD looked at the 2013 Elite Series schedule, he saw very diverse fisheries, each with different seasonal patterns, capped off by the finale on Lake St. Clair. "It's the closest thing to a home lake for me," said KVD. Jonathon VanDam needs a good showing on Lake St. Clair this week like his 2nd place finish last week during the St. Lawrence River Showdown to ensure a 2014 Bassmaster Classic berth. Photo credit: B.A.S.S./James Overstreet. Although mathematically eliminated from the AOY race, there's still plenty at stake for Jonathon VanDam, Wellman and Pipkens – most notably, the chance to qualify for the 2014 Bassmasters Classic on Lake Guntersville, Alabama. The top 30 AOY points leaders automatically qualify for the Classic as does anyone who's won an Elite Series or Bassmaster Open event in 2013. 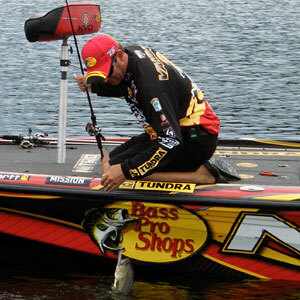 Of the four Michigan pros, KVD has already locked up his spot, ensuring the continuation of his streak. Jonathon VanDam is currently in 24th place but only 29 points above the 30th place angler and can't afford a major setback on St. Clair. For Wellman and Pipkens, the road to the Classic comes down to needing a win in either the Lake St. Clair tournament, one of the few remaining open tournaments, or the December Bassmaster Wild Card tournament on Lake Okeechobee, FL. A victory on Lake St. Clair would be huge for Chad Pipkens following his first top ten finish last week during the St. Lawrence River Showdown. It's his best shot for a 2014 Bassmaster Classic spot. Photo credit: B.A.S.S./James Overstreet. Wellman and Pipkens would love nothing better than to lock up their Classic bid in Michigan, but to do so, they'll need to account for wind and rough water which will probably impact strategies at some point over the four day tournament. Pros familiar with the Great Lakes understand the importance of a solid backup plan – and just in case - back-up plans for their backup plans. Fortunately, late–summer on the extended Lake St. Clair fishery provides several options. Typical late-summer Lake St. Clair patterns revolve around finding nomadic schools of big smallmouth that roam expansive main lake flats in pursuit of perch. Finding smallmouth on Lake St. Clair probably won't be a problem. Finding enough big fish and staying on top of them for four days might be. Based on results of earlier tournaments, the average weight of Lake St. Clair smallies seems to have dropped compared to the past few years. Late summer and fall typically mark the start of a migration of big smallies into the Detroit River. However, it's not clear how many big fish will be in the river by the start of the tournament. Expect this area to get a lot of scrutiny during practice. And when the wind howls on Lake Erie, pros who've found bass in the Detroit River will be glad for the nearby refuge. The fickle Erie winds could lead an Elite pro to victory or crush their hopes. Fun fact; Oliver Hazard Perry's opportunistic use of a change in wind direction led to his victory over Commander Barclay in the Battle of Put-in-Bay almost two hundred years ago to the day. In the past few years, Lake Erie's smallmouth fishery has been somewhat overshadowed by the phenomenal Lake St. Clair fishery. But Erie remains a consistent producer of big smallmouth and might just be the primary option for most pros, especially if the wind doesn't blow too hard. Like most tournaments on this huge, often volatile fishery, success or failure will ultimately come down to good decision making.